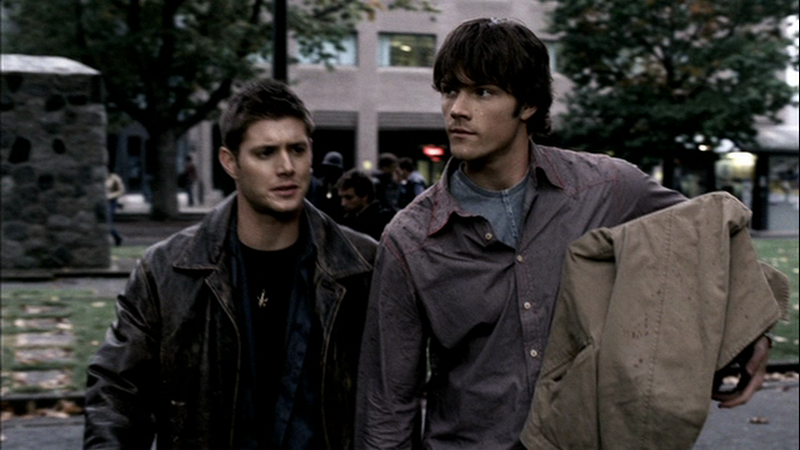 In the above Screen Cap, Dean is as confused as I am about Sam’s T-shirt. What is with that awkward seam down the front? Was this a repair job gone horribly awry? Nevertheless, it makes what would have been a generic grey T into something unique, and therefore makes this list. In Bugs (1x08), Sam wears it starting after the second death (spiders) until after the bug attack. FATE: Sam must have decided that he wasn't fooling anyone with those tailoring skills and thrown it away - or perhaps used it as car-rags. I'll check out the end of Phantom Traveler when I get a chance and confirm. My methodology improved as I went through the seasons, so I wouldn't be surprised if I missed an appearance in S1.